One of archaeological sites of Egypt's first capital, El-Fustat, is under attack — threatened to be turned into a garden by order of Cairo governorate and approved by the Ministry of Antiquities, say cultural and archaeological activists. "El-Fustat site is officially now going to be transformed into a garden after its ownership was transferred from the Ministry of Antiquities to Cairo governorate. Excavation works in this important archaeological site in Cairo are threatened to be lost forever," activist Sally Soliman, founder of the "Save Cairo" Facebook group, told Ahram Online. El-Fustat was the first capital of Egypt under Islamic rule. Built in 641AD by Islamic commander Amr Ibn El-As, the city was the heart of Egypt for nearly 500 years, hosting a large number of ancient mosques and buildings, including Egypt and Africa's first mosque, Amr Ibn El-As Mosque. It is recognised by UNESCO as a World Heritage site. This week, activists found a wall built around the archaeological site and a banner hanged, making it clear that the site is owned by Cairo governorate. The site was also guarded by a Central Security Forces vehicle. The “Save Cairo” watchdog group, formed to preserve Cairo’s cultural and archaeological heritage, raised the matter in the media. "Before 2011, a French archaeological mission was working at the site, uncovering old buildings. But then the excavation works stopped because of the security situation," Soliman explained, adding that "Save Cairo" contacted the French archaeological mission about what is now happening at the site and are awaiting its reaction. 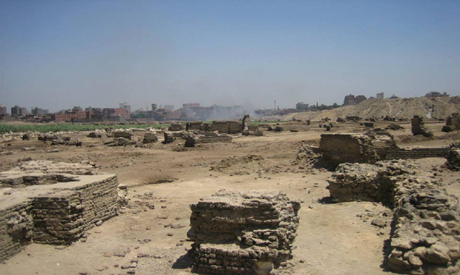 After excavation works stopped, the site became a rubbish dump, with no intervention either of Cairo governorate or the Ministry of Antiquities. "Already turning the site into a dump, and then into a garden, is violating Article 20 of the Antiquities Law, not to mention threatening monuments and excavation works," Soliman said, adding that the irrigation systems and landfill works of the proposed garden would negatively affect the mud buildings and archaelogical remnants found at the site. According to Article 20 of the Antiquities Law, no permits can be given to construct buildings or cemeteries or allow agriculture in proximity to archaeological sites of interest. Soliman believes that the Ministry of Antiquities and Cairo governorate are playing a game and that El-Fustat archaeological site will be the first in a series of other such sites turned into urban projects. “I believe that the site will be turned into a garden temporarily, and then turned into something else,” she commented. For its part, the position of the Ministry of Antiquities is unclear regarding the site. "The site was full of garbage, which was affecting negatively El-Fustat monuments. It is being cleaned now by order of Prime Minister Ibrahim Mahleb after his visit to the area," Samarat Hafez, head of the Islamic Antiquities Sector at the Ministry of Antiquities, said earlier this month in a short statement published by the state-owned MENA news agency. “We managed to take back this site seven years ago from Arab Contractors Company. There were excavation works and plans to turn the site into buildings serving the Islamic Fustat Antiquities Sector — of course after excavation works finish,” Hafez told Ahram Online. The projects of the ministry at the site were halted then, according to Hafez, for reasons related to funding. “Then we found out that locals, aided by thugs, turned the site into a dump where not only do they deposit garbage, but also burned it there. It was not only dangerous to the site and the excavation works, but dangerous to El-Fustat warehouses where very important pieces are kept,” Hafez said. According to Hafez, Cairo governorate cleaned the site twice in the past few years, at a cost of nearly LE2 million, but in vain as thugs returned back to the site using force. “All this stopped when PM Mahleb visited the site. The officials of the ministry complained to him and he issued his decisions to clean the site immediately,” Hafez added. For Hafez, the warehouses of El-Fustat are much more important than the site. “What I care most about here is that I saved the warehouses of El-Fustat, and what they contained.” Asked about El-Fustat site now, and the fears of activists, Hafez said that Cairo governorate would only fill the site with sand. “Sands do not harm the excavation works but rather preserve them until the next excavation season,” he said. Despite what Hafez told Ahram Online about the site being under the control of the Ministry of Antiquities, a large sign makes it clear that, “This site is owned by Cairo governorate." On the "Save Cairo" Facebook page, leaked memos and correspondence from the Islamic Antiquities Sector in the ministry to the High Council of Antiquities show direct requests to stop immediately landfill works at the site that was being overtaken by Arab Contractors Company and Cairo governorate in violation of the Antiquities Law in April 2014. The memos and correspondence show that Arab Contractors Company stated that it was informed by Cairo governorate that the site would be evacuated 30 March 2014. The memos also pointed out that the site was part of El-Fustat area, which is a UNESCO World Heritage site in Egypt. Islamic Antiquities Sector officials warned of the dangers of landfills works to excavation at the site. Despite a general silence in civil society regarding the status of the site, and what it represents in Egyptian history, the Egyptian Creativity Front issued a statement slamming Cairo governorate and the Ministry of Antiquities for turning El-Fustat into a garden. "The Egyptian Creativity Front condemns Cairo governorate and the Ministry of Antiquities for how they turned the archeological site of El-Fustat into a dump and then into a garden, attacking one of Egypt's most important archeological sites," reads a statement published by the Egyptian Creativity Front on its Facebook page Monday. The group demands that the government to stop tranforming the site into a garden immediately. The Egyptian Creativity Front was launched in January 2012 by a number of artists and intellectuals. Prominent film producer Mohamed El-Adl is one of the co-founders of the group that includes Egyptian actors, visual artists, musicians, filmmakers and literary figures. At the time of its establishment, the prime aim of the Egyptian Creativity Front was to face what members perceived to be pressure from Islamists to limit the freedom of expression. El-Fustat is not alone in being under threat. Soliman and "Save Cairo" are also concerned for the fate of other archaelogical sites in Islamic Cairo. "We are very concerned about the Darb Al-Ahamr area as we received a lot of reports on illegal building beside Islamic mosques and ancient sites there," Soliman told Ahram Online. Considered one of the poorest areas in Cairo, Darb El-Ahmar contains more than 50 historical monuments, including mosques and buildings dating back hundreds of years. “Antiquites Minister Mohamed Ibrahim himself told CBC TV channel earlier this month that there are 192 demolition orders issued to remove unauthorised and illegal buildings built beside and adjacent to the mosques. But nothing happens on the ground,” Soliman said. Soliman added that such illegal building goes back beyond the January 25 Revolution and the lack of security afterwards. "That process started before the revolution, way back to where Darb El-Ahmar district shut its eyes to an illegal building marathon that took place in the area, beside ancient mosques and buildings," she added. Soliman and her team of activists and concerned citizens are awaiting the promulgation of the new NGOs law, in order to become an official NGO aimed at protecting and saving Egypt's archaeological heritage. While waiting on the law to be issued, she and others began to spread the idea of "Save Cairo" online, using social media. Interested young archeologists, as well young activists, began to form groups on Facebook in different governorates in attempt to save threatened heritage in their local areas. Now there are "Save Alexandria," "Save Mansoura" and "Save El-Minya" groups in existence. The "Save Alexandria" group is the most famous, focused on saving the coastal city's remaining historical villas, palaces and buildings, like Villa Aghion. "I do not have money or power to go to all governorates, but I spread my idea online and thankfully youth began to form their own groups in order to preserve their own governorates' history," Soliman told Ahram Online. This area must be persevered for future generations it's history,it's Egypt's 1st Islamic capital let's hope that sponsors in the Islamic world read this and assist,help and preserve El Fustat or rebuild it and show off it's former splendor. El Sisi shows his hatred of Islamists in all facets of his totalitarian dream. It documents important event that is threatening our heritage and culture. We need more of this high quality reporting to educate the masses about our wellbeing and shear existence. Fanatics and terrorists are trying to hijack our culture. That's why they are not ready to stop Israeli activities in Egypt. Sisi is agent of Israel and Zionazis.